Sylvester Stallone, Antonio Tarver and Milo Ventimiglia star in Rocky Balboa, the sixth installment in the ‘Rocky’ franchise. 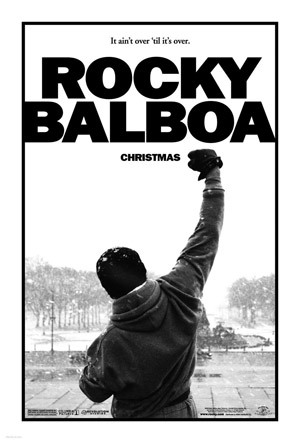 Watch the movie trailer for Rocky Balboa below. Thirty years after the ring of the first bell, Rocky Balboa (Stallone) comes out of retirement and dons his gloves for his final fight; against the reigning heavyweight champ Mason ‘The Line’ Dixon (Tarver). MPAA Rating: PG for boxing violence and some language. The greatest underdog story of our time is back for one final round of the Academy Award-winning “Rocky” franchise, former heavyweight champion Rocky Balboa steps out of retirement and back into the ring, pitting himself against a new rival in a dramatically different era. After a virtual boxing match declares Rocky Balboa the victor over current champion Mason “The Line” Dixon, the legendary fighter’s passion and spirit are reignited. But when his desire to fight in small, regional competitions is trumped by promoters calling for a rematch of the cyber-fight, Balboa must weigh the mental and physical risks of a high profile exhibition match against his need to be in the ring.